Yesterday, Saturday morning, I arrived at the parking lot in the shadow of the Pillar Point Air Force Station around 6:30 a.m. I’ve been driving over early every morning without worrying about getting a parking space. There’s 40-50 slots. But not yesterday. That early in the morning the pot-holed parking lot was jammed. There was action, movement, people, but in the middle of it all there was a big silence, almost spiritual, as surfers in their black wet suits knelt on the ground, waxing their boards. I thought, wow, maybe this is it: maybe the call went out for the big contest, maybe the waves are SKYSCRAPER TALL. 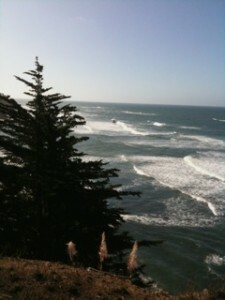 I ended up driving north to the Moss Beach side of Pillar Point and walked back toward Mavericks. The waves were nice but no cigar, no contest. What remains in my head is the image of all those folks moving about in the parking lot and all that silence. Just in time for Halloween, we are offering one of our favorite celebration cakes for $99.99 (includes shipping.) This fabulous citrus cheesecake on a shortbread crust is enveloped in imported white chocolate in shades of periwinkle and green. Order by Friday, October 30, 2009 to receive this promotional price. Festive for any affair that requires a fabulous citrus cheesecake on a shortbread crust. 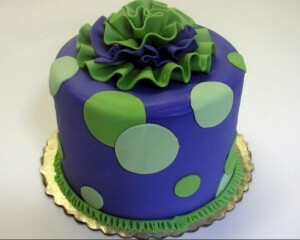 This fun cake is enveloped in imported white chocolate in shades of periwinkle and green. If you can have a home of your own— at a price you can pay, at a distance you can afford to travel, where the climate is the best, the soil the richest, the view the most inspiring: — will you consider the proposition worth looking into? where there is a magnificent beach, with warm water and excellent bathing, with an unobstructed view from all lots, is San Pedro Terrace-by-the-Sea. Not in all the suburban community of San Francisco, growing with unprecedented strides, is there so desirable a tract in which to buy a homesite. From $250 upward lots can be obtained, and payments made in installments of only $5 a month. Consider what this means. There is no Interest to be paid. There are no taxes. Many free improvements, such as boulevards, a casino, an esplanade, bathhouses and glass-bottomed boats, are contemplated. reveal all the varied and marvelous life of the deep. There is only one other coast on the beach where Barker bathhouses can be used, and these will be another attraction and an important convenience. Whether you buy to build, or buy as a speculative investment, you will reap a rich profit. If you build you will obtain for yourself a home in as desirable a spot as favored California -affords, within easy access of the city, and where your wife and children can have all the advantages of the country. If you buy as an investment you secure a piece of property which will constantly and rapidly increase in value. It will cost you so little each month— only $5 or so— that you will not miss it. Consider how often you “blow In”* a five-dollar bill. The same spent in a lot at San Pedro Terrace-by-the-Sea will make you practically independent. Be your own landlord and have a convenient suburban home. home in the country, which he can leave at a reasonable hour in the morning and to which he can return at his convenience in the evening. At San Pedro Terrace-by-the-Sea is found all that can attract a man who wishes to leave behind him at the close of a day’s work all the cares and distractions and noises of the city, and to have within easy access of his office a delightful spot, where nature and artifice happily co-operate to make everything wholly charming. Soon the Ocean Shore Railway will have a great terminal station at Twelfth and Market streets in San Francisco, and from there its trains, on elevated tracks, will leave at speed approximating fifty miles an hour. The ride to San Pedro Terrace-by-the-Sea is probably the most picturesque suburban ride in America. At times the tracks are 200 feet above the breaking surf: at others almost level with the waves. The present terminus of the Ocean Shore Railway is the San Pedro valley, and it is in the direct line of destiny of the city’s growth. A narrow valley, level as a floor, it winds its way down to the sandy beach between gently sloping hills, and the beautiful landscape of hill and valley finds appropriate expression In the name — San Pedro Terrace-by-the-Sea. February Twenty-second and Twenty-third. Nineteen Hundred and Eight. San Pedro Terrace by the Sea is the present terminal of the OCEAN SHORE RAILWAY, within thirty minutes of San Francisco and is its most beautiful seaside suburb, second to none on the Coast being ten degreess warmer than any other northern waters. Music will be furnished and a specially prepared BOUILLE BAISSE LUNCHEON will be served from noon to three P. M. Guides will be on hand to show all visitors the many points of interest in this attractive valley. Present this invitation to our representative at San Pedro Terrace by the Sea who will refund to you the amount of your transportation. 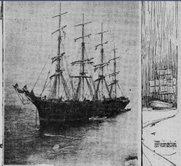 Here’s another shipwreck story, this one on Pedro Point, that I found in the September 5,1904 issue of “The San Francisco Call.” I wonder how they got the Captain’s wife’s photo? Maybe that is why she didn’t want to do an interview, after having the flash powder go off in her face, probably without notice. This was just one of four shipwrecks that happened in a 24 hour period because of the thick fog. IRON SHIP THAT DRIFTED ON THE ROCKS OF PEDRO POINT SATURDAY NIGHT DURING A DENSE FOG AND WHOSE HARD BED GAVE EVERY PROMISE OF MAKING A NEW ADDITION TO THE “GRAVEYARD OF VESSELS” ON FATEFUL PROMONTORY. The four-masted iron ship Drumburton, lies jammed on the rocks off Point Pedro. She was towed from this port Saturday and set on her way to Seattle. A dense fog settled upon the ocean and in a dead calm the ship drifted with the current southward through the white silence. At about 7 o’clock Saturday night she crashed bow foremost on the rocky bottom of the Point. There is little hope of her being taken off. A ragged hole is punched in her hull and she is filled with water. The vessel was sailing in ballast at the time and the only loss sustained is about $45,000, the value of the Drumburton. This is offset by $38,000 insurance. the rocks a year ago. “Can’t some one come, out with a boat?” was shouted from the vessel. “All right,” answered Scott. He hurried to his cabin and launched a small boat that he uses in his trade. Guided by the shouts of the Drumburton’s crew and the flare of an occasional rocket, the intrepid fisherman rowed through the darkness to the vessel’s side and boarded her. After a hasty consultation, Captain Thomas decided to send Second Mate William McDonald, and a seaman ashore to seek assistance. Scott, rowed them back, luckily the sea was not rough or the little fishing boat would have been swamped. The mate was taken to Colma in a livery rig, but could send neither telephone nor telegraph message from the point. He reached this city late at night and notified the Spreckels Tug Company of the accident. The Defiance arrived at the scene early yesterday morning, but the Drumburton was wedged tightly on the rocks and could not be pulled off. The Drumburtor. is a first-class iron ship, valued at $45,000. She was insured for $38,000. She had been lying idle in Oakland Creek for several months awaiting a charter, which she received only a few days ago. The ill-fated ship was to go north and load at Port B!akeley with lumber for Valparaiso. She was built by Russell, in Glasgow, Scotland, for Gillson & Chadwick. According to Captain Thomas, shortly after the Drumburton was freed from the tug the fog fell like a pall over her. The wind died down and she drifted, a helpless hulk, at the mercy of the current. “I had nothing to get my bearings by,” said Captain Thomas. The vessel drifted through the white mist. Neither captain nor crew knew whither or how swiftly the ship was going. They were utterly helpless. They heard nothing but the splash of the waves against the vessel’s sides. They saw nothing but fantastic shapes in the fog that seemed to mock their bewilderment. Praying for the friendly voice of a fog horn or the sight of a light they drifted through the gloom. The entire crew was on deck peering into the fog and listening for the terrifying crash of breakers that they expected momentarily. Wrapped in a cloak the captain’s wife waited beside her husband.. She had left a hospital shortly prior to the sailing that she might accompany Captain Thomas on the voyage.. She was beside him when with a lurch the Dumburton grounded on the rocks. Plugging forward the ship settled on the bed that will be its tomb. There was no confusion when the shock came. The crew prepared to launch the small boats, but as the ship remained motionless even in the trough of the sea, Captain Thomas, decided that it was perfectly safe to remain on board. Steward Joe Plum sent up rockets, which attracted the attention of those on shore. Both Captain Thornas and Mate McDonald say that if a tug could have been secured Saturday night the Drumburton might have been floated. Now she lies in the clutch of the rocky promontory that stretches like a bony arm almost in reach of the path of coasting vessels. The ship’s bottom is badly torn and the approach to her is so dangerous that all hope of floating her has been abandoned. 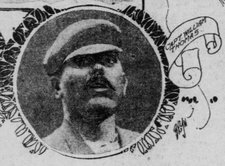 Even Captain Barneson is resigned to the loss, which is not great owing to the heavy insurance. 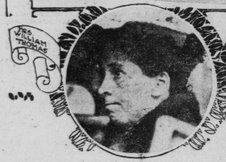 Mrs. Thomas was taken from the doomed ship by the Spreckels tug Defiance. She was conveyed to a hotel by a cousin of her husband. The cousin, who bears the same name as the skipper of the Drumburton, and who is also a mariner, refused to permit Mrs. Thomas to be interviewed. He said that the shock of the disaster had brought back her illness. The crew remained on the vessel yesterday. They were shipped Saturday from the Sailors’ Home. The seamen will be brought back to that institution to-day. Their names follow: J. Moorl, J. Plum, Evans, ‘Williams, Phinski, E. B. Van Houten, J. Van Houten, R. Tiacks, A. Kuhlberg, Charles Olefeldt, J. Pawadlar, O. Banteille. J. Neven, R. Lewis, P. Flatens, Thomas Jesson, Aseley and Brady. June says: I LOVE these ads for Princeton By The Sea. Thank you, John. A little taste of Princeton….or is it Pillar Point? In the early 1900s a circle of important Half Moon Bay citizens met at the Patroni House in Princeton-by-the-Sea to discuss the tragic death of a local, popular fisherman. The beautiful bay was a wild, open harbor, and, during stormy weather, dangerous “Black Hand Reef” meted out its punishment, in this case, death to the poor fisherman. The esteemed citizens, all men, lamented the open harbor. The fact was, all along the San Mateo County Coastside, there were no safe harbors, and, believe me, businessmen of great vision, had tried to harness the waves, wind and weather. Half a century passed, until after WWII, when funds became available, a breakwater was constructed at what was called Pillar Point Harbor, with the work conducted by the Army Corps of Engineers. The harbor was named in honor of that sphinx-like slice of land stretching into the Pacific Ocean, called Pillar Point, or its less known historical place name, “El Pilar.” Today, to the north of”the Point,” as the local surfers originally referred to it, PP has been christened “Mavericks,” the world class surfing spot located out beyond a perplexing every which way flow of waves. When the waves at “Mavericks” are high-rise tall, the call goes out to the famous of surfers who are invited to a contest in the waves that brings the best to Princeton-by-the-Sea, or as some are cal it: Pillar Point. This is confusing but I will endeavor to explain the difference between Princeton and Pillar Point. 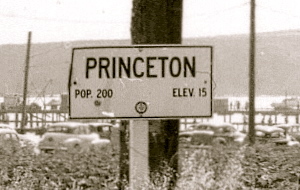 Princeton is where the shops and restaurants are located. To the west, there is Pillar Point Harbor, where a combination of yachts and fishing boats are moored. And the closer you live near, or walk the trails, near the land form called Pillar Point, some folks say they’re standing in a place called Pillar Point. As a wide open harbor, punctuated with geographical exclamations (that is, they were, in the past, unconquerable) Princeton, and the entire Coastside, was like an isolated island, with a small, malleable population, and what turned out to be a perfect place for the profitable, but illegal business, of Prohibition. Princeton thrived during Prohibition–there were 3 harbors but the one most used was located across the way from the Patroni House, a once lively roadhouse, torn down circa late 1940s, near the present day site of the new Oceana Hotel & Spa. The best way to enjoy Princeton, and Moss Beach, Princeton’s sister beach town, is to walk the inspiring cliff-side trail north of Pillar Point, high above “Mavericks,” the world-class surfing venue. It’s also an excellent spot to imagine what Prohibition was like, with the Coast Guard, whose little building still stands in Princeton but is now called the Half Moon Bay Yacht Club, chasing the clever rumrunners, local fishermen who met the Canadian mother ships anchored some miles out in the Pacific. When Prohibition was repealed in 1933, an intrepid and industrious way of life that had jobs for the entire, close-knit community ended as well. But sardines, a good source of Vitamin A, saved the day!–as a couple of canneries appeared before WWII, and a Half Moon Bay kind of “Cannery Row” grew up around Princeton. I have heard fisherman John Koepf say in the 1970s, repeating what he learned from his father: “You could get ’anything’ in Princeton.” Restaurants sprang up with the names of the female owners like “Idas” and “Hazels.” The abalone was fresh and plentiful and diving for them drew a special breed who collected stories, including the best ones they heard from the old rumrunners who were still hanging around the harbor waiting for Prohibition to return. Princeton remained a place out of the ordinary, eccentric in a Coastside way, the geographical barriers continuing to keep outsiders on the opposite side of the relentless mountains. It was an adventure, the kind literary books are written about, to visit quaint Princeton. At one point in the late 1950s a small band of edgy beatniks, kicked out of what you’d think would be a very permissive North Beach in San Francisco, relocated to Princeton, to a house called the “Abalone Factory.” What went on inside the Abalone Factory is the stuff of local lore. Originally, Princeton-by-the-Sea was the concept of early 1900s Ocean Shore Railroad era developer Frank Brophy; the Princeton name was his idea, and if you wander through the unpaved streets worth wandering through, you will be impressed to discover that you are walking down Stanford, Harvard, Columbia or Yale, streets that make you feel like you are strolling among the highly educated, yet nobody can confirm how the names found their way onto the streets signs of this still funky fishing village beach harbor surfing place. 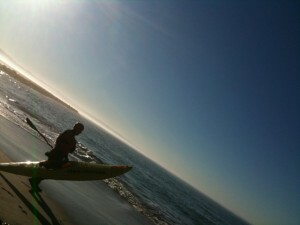 Posted in Uncategorized	| Comments Off on A little taste of Princeton….or is it Pillar Point? Kite Surfing near Princeton-by-the-Sea from June Morrall on Vimeo.